Back us now through our Kickstarter! 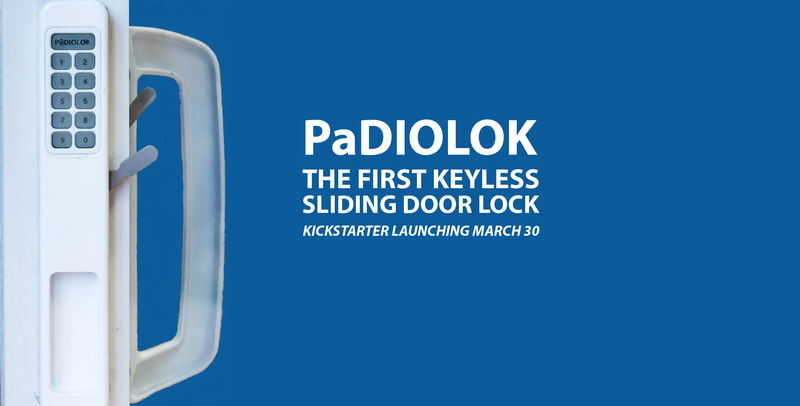 PaDIOLOK is the world’s first keyless, 2-way lock for sliding patio doors. Our revolutionary lock works with new or existing doors, enabling you to use your current sliding door as an entry or exit. PaDIOLOK is designed for residential homes, apartments, condominiums and hotel rooms with ground floor sliding patio doors. People have long-suffered inconvenient and insecure sliding door locks on their homes and poolside hotel rooms, but no longer! Now PaDIOLOK provides a solution with a 2-way lock that lets you come and go, locking and unlocking in either direction without a physical key. Be liberated from inconvenient, insecure locks. Learn more about how Padiolok works, and find the lock that will work for your sliding door here. If you’ve been patiently waiting to get your PaDIOLOK, now is the best time to buy. Our campaign will give you the opportunity to support PaDIOLOK at a great price. We’re incredibly excited to offer you the very first opportunity to get the world’s first keyless 2-way patio door lock for typical existing and new sliding patio doors. And, to say thank you for supporting us in our next steps of getting our lock manufactured and ramping up sales, you can purchase it for 10-40% off the retail price by backing us on Kickstarter. If you’ve supported projects on kickstarter before, you probably know how the crowdfunding platform works. But if not, you can learn all about how kickstarter campaigns work here. We’re delighted to have your interest. Do you have questions, comments or concerns? We’re here to answer them, and help you directly. Simply contact us by filling out this form here. Thanks for your interest, and once again, we’re thrilled to have your support! Stay in touch by following us on Facebook, Twitter and YouTube, and sign up to join our mailing list below. We won’t sell your contact info or use it for anything other than letting you know about PaDIOLOK. Unsubscribe whenever you want. How important is the wireless capability to you? : ---I don’t need wireless… the convenient keypad will be great for me for years.I would like wireless but wouldn’t wait for it as I’d still be happy with the awesome convenient keypad.I would like wireless and would at least prefer a product which is upgradable to wireless if not available immediately.I need wireless and will wait for it. I want to be advised as soon as padiolock is available. I want to be advised as soon as promotional pricing is available.